The Economics of Land Degradation (ELD) research shows that land degradation is occurring in almost all terrestrial biomes and agro-ecologies, in both low and high income countries and is stretching to about 30% of the total global land area. About three billion people reside in these degraded lands. However, the impact of land degradation is especially severe on livelihoods of the poor who heavily depend on natural resources. The annual global cost of land degradation due to land use and cover change (LUCC) and lower cropland and rangeland productivity is estimated to be about 300 billion USD. Sub-Saharan Africa (SSA) accounts for the largest share (22%) of the total global cost of land degradation. Only about 38% of the cost of land degradation due to LUCC - which accounts for 78% of the US$300 billion loss – is borne by land users and the remaining share (62%) is borne by consumers of ecosystem services off the farm. The results also show that reversing land degradation trends makes both economic sense, and has multiple social and environmental benefits. On average, one US dollar investment into restoration of degraded land returns five US dollars. The findings of the country case studies call for increased investments into the rehabilitation and restoration of degraded lands, including through such institutional and policy measures as strengthening community participation for sustainable land management, enhancing government effectiveness and rule of law, improving access to markets and rural services, and securing land tenure. Cartography: Zhe Guo. 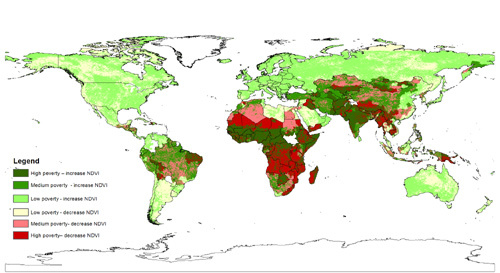 Data sources: Global Land Cover Facility (www.landcover.org), Tucker et al. (2004), NOAA AVHRR NDVI data from GIMMS. Note: Infant mortality rate is taken as proxy for poverty. ELD research is based on representative case studies around the world in Argentina, Niger, Senegal, Kenya, India, Uzbekistan and other countries. Land erosion rises dramatically worldwide. Scientists presented research results at a press conference on land degradation in Berlin on February 11, 2016, with Klaus Töpfer. The Economics of Land Degradation.